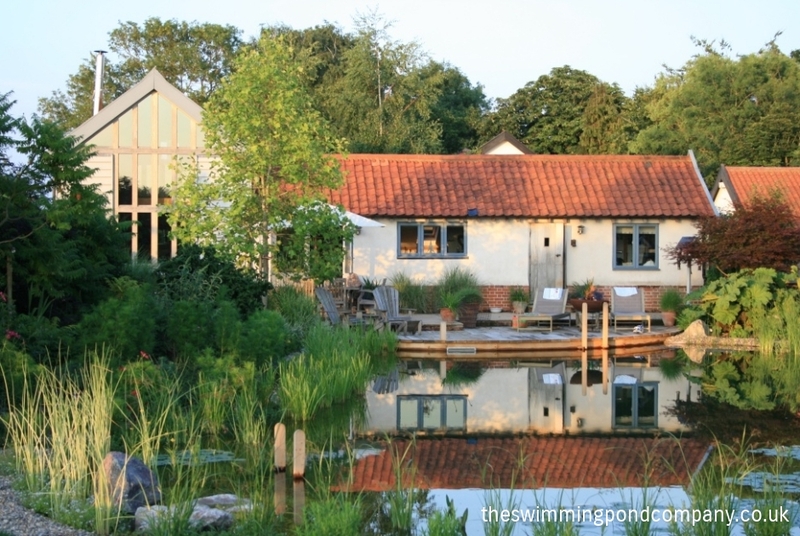 Norfolk Magazine - The Swimming Pond Company Ltd. Looking to take the plunge this summer with your own swimming pool? Annie Hirst meets a man who has done just that – but who has created a pool with a difference. If, as everyone expects, it’s going to be another long, hot summer then a cool dip in your own pool seems very attractive. Though, no matter how much more sun we get, swimming pools can only be used for a relatively short time in this country. However, if you opt for a pond and not a pool then you will have added a year-round asset to your home – and a very beautiful one at that – which you can also use for swimming. Another plus-point is that you can do so without damaging the environment. A popular concept in Austria, France and Germany, swimming ponds were first introduced to this country in 2001, and, though still relatively new here, last year a Norfolk landscape designer took the plunge and set up his own company, The Swimming Pond Company. Now there’s nothing that demonstrates your belief in your product than having one on your own doorstep. Rounding the corner of Paul Mercer’s home, I catch my first glimpse of the swimming pond and I simply fall in love with it. That’s the case, even though some of the plants aren’t at their best so early on in the season, as Paul explains. The swimming pond looks magnificent to me – a beautiful oval of water gently stirred by a small fountain cascade set in a an oasis of greenery with a further stretch of water beyond that. Perfect. By now, we’re standing on the decking from where you can access the pond for swimming – it shelves to a depth of around 2 metres (“great for diving in,”says Paul) – and the overall effect is so visually appealing, I can’t think why anyone would choose a conventional swimming pool when you can have a swimming pond like this. “They are also known as “natural swimming pools” and that’s what they are – environmentally-friendly, attractive to wildlife and they blend into the landscape,” Paul tells me. “Can you imagine what a rectangle of blue would be like here?” he asks as he directs my gaze to the wide expanse of open countryside beyond his own large garden. I have to admit it would be a real blot on the landscape, while the swimming pond serves only to enhance what is a lovely view. Appearance and concerns for the environment apart, a swimming pond is also a very practical consideration as there are no chemicals involved so regular checks and maintenance are unnecessary; it doesn’t have to be covered to stop rainwater getting in; it can be left for long periods if you go away; and the running costs are minimal. So how does it work? As I understand it, it is separated into two zones: a swimming zone and a regeneration zone, and the plants in this latter zone act as a living filtration system, absorbing nutrients to clear and purify the water and maintain a natural swimming environment. Meanwhile, despite being surrounded by foliage, the swimming zone is kept free of plants to allow uninterrupted swimming. As we walk around the pond, Paul points out that the plants grow in a fine gravel sub-strata so that they can draw their nutrients directly from the water. The gravel also acts as a filter in that water is drawn down through it via a series of 100mm perforated pipes by a suction pump and then returned, clean, into the swimming zone. Initially, I thought the small cascade was just to add the finishing touch of the sound of trickling water; not so, it”s all part of the way the swimming pond works. By now I think I understand it, but Paul is only too ready to explain the concept and show around those who may be interested in having their own swimming pond. “We’ve now had a full summer using it, even taking a dip in mid-October, though that was a little fresh. And, of course, we can sit out here and enjoy it all year round,” he adds. Though it is early days yet, The Swimming Pond Company has already installed a swimming pond at the home of top garden designer, Tom Hoblyn, who naturally wanted something to blend into the landscape. So too did Paul and his wife Bianca who met on a garden and landscape design degree course at Writtle College, near Chelmsford; for them a design that looks good is very important. “We’re really pleased with the way our swimming pond looks – and it”ll continue to get better and better as the plants become more established,” says Paul, whose home is at Bressingham. Swimming ponds can be any shape, and first thing Paul does is a site survey to check whether it is possible to build a swimming pond within the garden. “It’s all down to the client – no two swimming ponds are alike – and when I see the garden, I can explain what’s possible and we can go through various concepts together. Then I draw up a presentation plan for the approval of the client. Projects generally take around six weeks to complete and can take place at any time of year. A friend of mine who owns a garden and landscape construction company with over 20 years experience in building ponds and lakes carries out the installations. I mean, look at this, it looks as though it’s always been here – and it’s wonderful to be able to swim surrounded by nature,”he says, pointing at his own swimming pond. Once people have seen it, I’m convinced that they’ll fall in love with it, just as I did.